“As for the prospects [of the settlement in Syria], we must say frankly that the situation remains complicated. 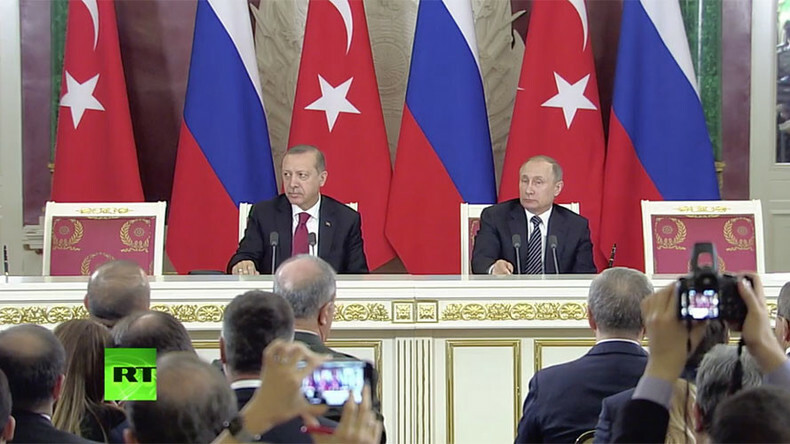 There are a lot of uncertainties; a lot of contradictions in the region and in the country itself – in Syria,” Putin said after the talks with Erdogan in the Russian capital on Friday. "Therefore, I want to express cautious optimism that by joining efforts with other solid players, including the US, we will be able to effectively contribute to the strengthening of the ceasefire regime and, on its basis, to move towards a full-fledged political settlement," he said. The Russian leader stressed that peace in Syria and the whole region can only be achieved if Syrian territorial integrity is restored. “For peace and calm to remain in the region and the rebuilding of Syria to begin, the principle of the territorial integrity of states must be respected, and in this sense the restoration of the territorial integrity of Syria is – in our view – a paramount condition for a full-fledged settlement in this country,” he said. The Russian leader has praised the level of cooperation between the Russian and Turkish militaries and intelligence agencies in Syria. “Mainly due to the active role of Russia and Turkey, it became possible not only to achieve cessation of hostilities between the government forces and the opposition, but to start direct, concrete negotiations between the warring sides in Astana,” he said. “Because of the coordinated actions by Russia, Turkey and Iran, the ceasefire in Syria is generally being observed. The level of violence has decreased,” Putin added. 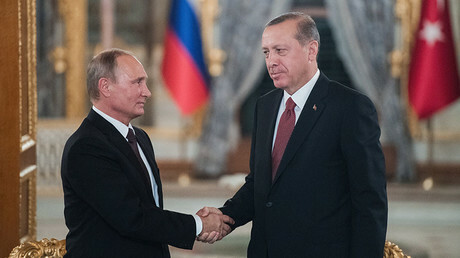 It was the second meeting between Putin and Erdogan since Turkey’s downing of a Russian bomber jet in Syrian border in November 2015 delivered a huge blow to bilateral relations between Moscow and Ankara. The Turkish leader expressed belief that the Friday’s talks completed the process of normalization of relations between the two countries. "We managed to overcome provocative actions and all problems. Much work was done to normalize our relations. We think that there is a noticeable shift in our relations,” he said. “Even if we do not agree on all issues, we keep all channels of communications open, as a result of the establishment of mutual trust we shall continue strengthening cooperation,” Erdogan said. Now that the relations have normalized, it’s time for “mutual trust” to prevail, according to the Turkish leader. Putin, on his part, said that Russia is considering Turkey a “key partner,” being ready to further develop political dialogue with Ankara. "We can say with certainty that our countries have returned to the path of authentic multi-faceted partnership," he said. The Russian president also announced that Moscow’s ban on hiring Turkish workers in the Russian construction industry, imposed among other restriction after the downing of the Russian jet, will be lifted in near future.